Arabs attempt to ram Jew, police arrest the Jew and confiscate his weapon. 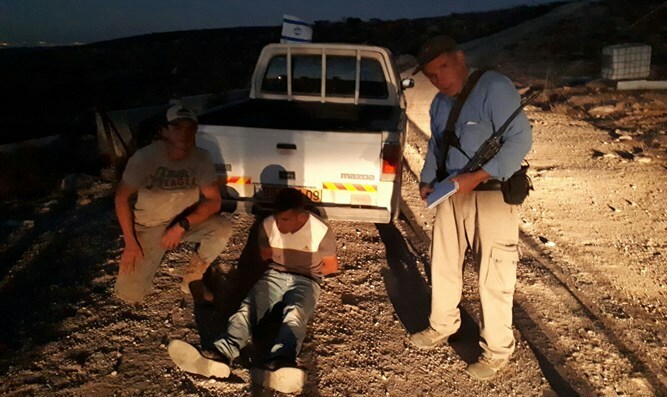 Three Palestinian Authority Arabs on Saturday afternoon infiltrated the grazing area of a Jewish town in the southern Hevron Hills. Entering Havat Talia (Talia Ranch), the Arabs attempted to ram Yedidya Talia, attorney Itamar Ben-Gvir said. Ben-Gvir reported that Talia was forced to draw his weapon and fire in the air. One of the Arabs attempted to attack civilians in Havat Talia, but they succeeded in overpowering him. Hevron police arriving at the scene arrested Talia. Several hours later, with Ben-Gvir's aid, Talia was released on bail, and his weapon confiscated. "This is a backwards world," Ben-Gvir said. "Instead of arresting the Arabs, the Hevron police arrested the victim and confiscated his weapon. The officers' actions are reminiscent of the British Mandate, and apparently the Hevron police, too, believe that if a Jew was not injured or killed, he must be the guilty party."